The new West Palm Beach Supercharger Station will have 8 charging terminals. 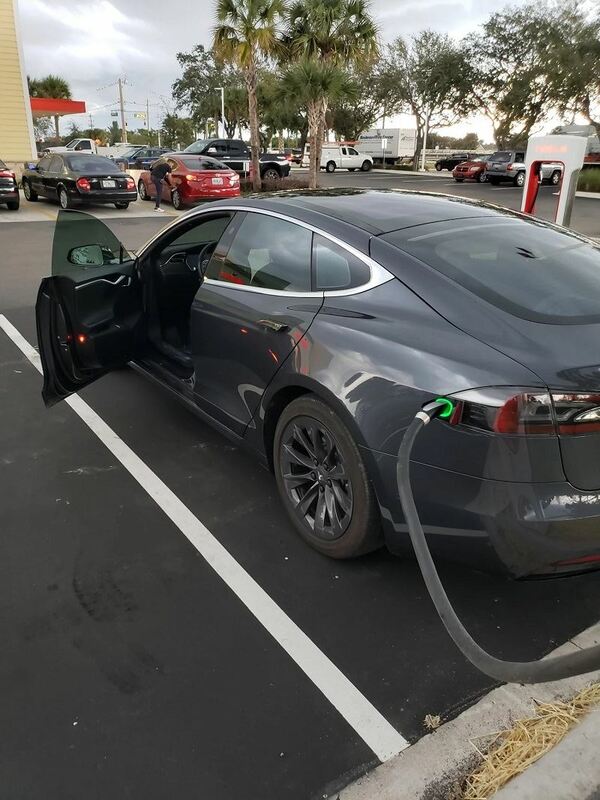 A members of the Tesla Motors Club online forum (screen names Oldschool496 and Racerx22b) have discovered the new “Coming Soon” West Palm Beach Supercharger Station. It is being constructed in the parking lot of a Wawa gasoline station at 7289 Garden Rd, West Palm Beach, FL 33404. The Supercharger Station will have 8 – 120 kW Supercharger terminals. 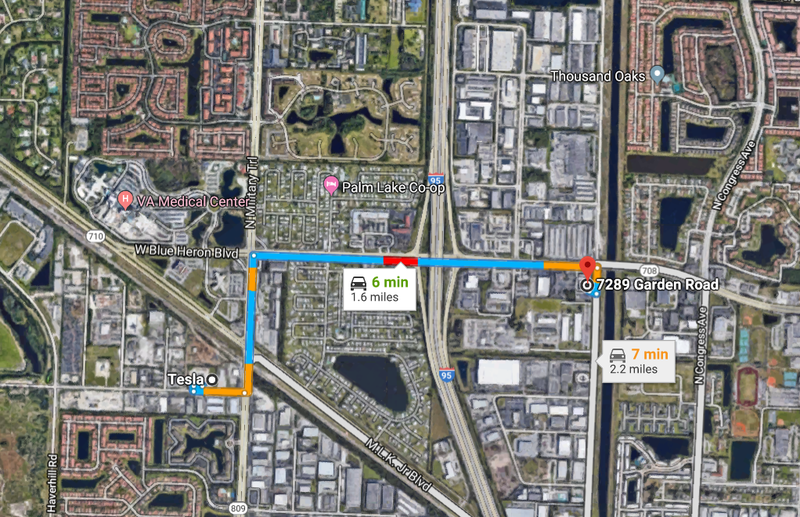 It is less than 2 miles away from the existing West Palm Beach Supercharger Station that is colocated with the West Palm Beach Service Center/Store on Dryer Blvd. It is likely that the Supercharger Station on Dryer will no longer be available as part of the public Supercharger network after the new station is operational. Utility transformer on left, installed meter center, 4 - Supercharger Cabinets on right. Update as of December 20, 2018. Tesla technician works on Supercharger cooling system. The Tesla technician estimates that the station should be operational in a few days depending upon final inspection by the city. Some of the 20 Supercharger terminals at the Sarasota Supercharger Station. This article is continuously updated as new Supercharger Stations in Florida come online. The table below lists all 32 of the operating Supercharger Stations. Click the link to the name of the station for a description of the amenities available nearby. In the comments section of the table are links to our articles discussing those locations that we have discovered being built. Please be on the lookout for signs of construction at the listed “Coming Soon” locations. If you spot any construction activity that looks like a Supercharger installation, please send me some high resolution photos. Tesla owners in Florida are fortunate to have an abundance of Supercharger Stations. With 32 operating Supercharger Stations, Florida is ranked third in the nation behind California and Texas. Those 32 stations provide access to 239 individual Direct Current Fast Charging terminals that can charge at over 300 miles of range per hour. 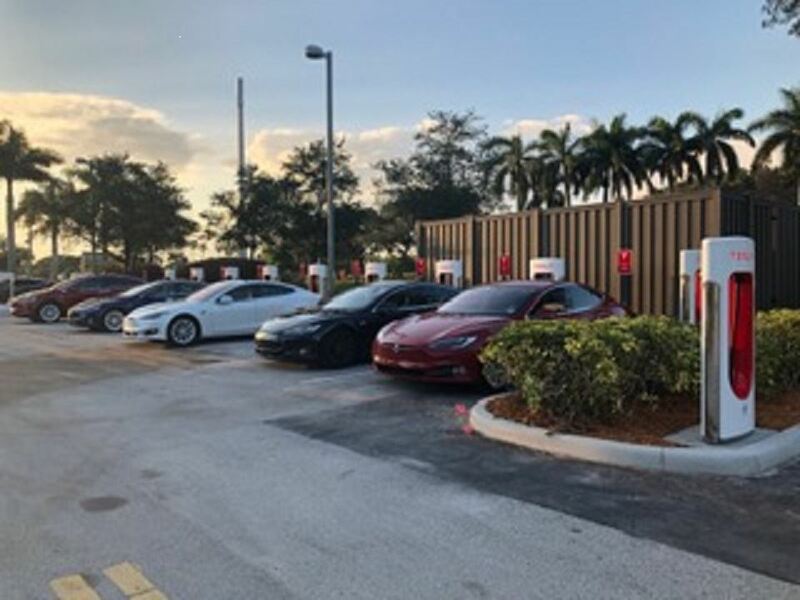 As Tesla continues to aggressively expand the number of Supercharger Stations in the Florida network, the size of many of these newer stations is also growing impressively. For instance, whereas the first Supercharger Station in the state installed in July 2013 only had 8 charging terminals, in September 2017 Tesla built a Supercharger Station in Sarasota with 20 – 120 kW terminals. Tesla has also introduced a new type of Urban Supercharger terminal. Designed for tight city locations the Urban Superchargers have a more compact design than the original Superchargers and they are deployed in even greater numbers. For example, the Urban Supercharger Station that went operational in May 2018 at Aventura Mall has 35 – 72 kW terminals. 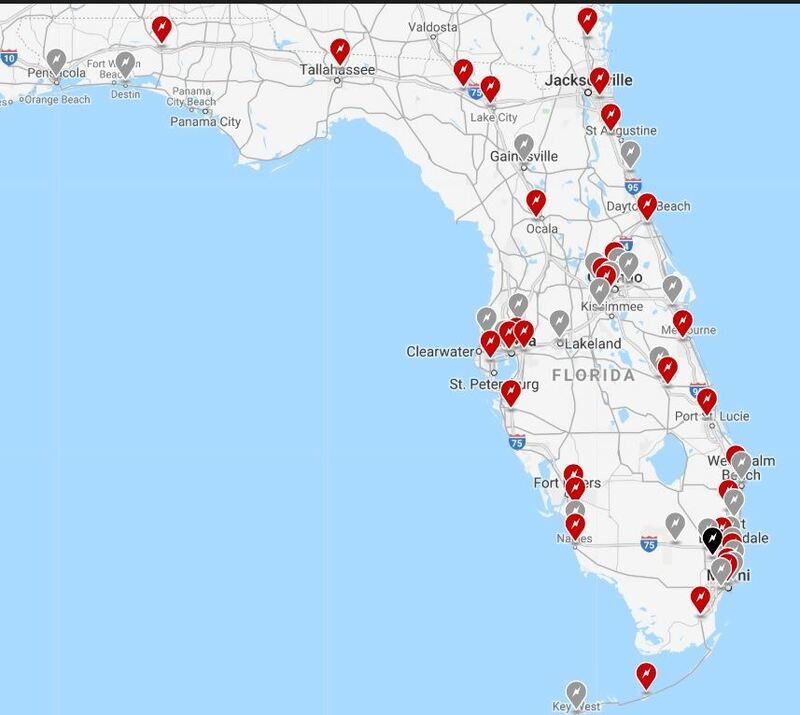 Below is a table listing the locations of all of the “Coming Soon” Supercharger Stations for Florida shown on Tesla’s official Find Us map. 16 are planned for 2018 and 10 for 2019. We only a couple of weeks left in 2018, so obviously some of the 2018 stations will slip into 2019, but nevertheless Tesla's progress in expanding the network has been impressive. We also discovered a new Supercharger Station under construction in Saint Johns that Tesla didn’t note on their map. So, there are actually 27 Supercharger Stations expected to be operational by 2019. In the Article section of the table are links to our articles discussing those "Coming Soon" locations that we have discovered to date. The articles are periodically updated when we receive new information. Ochopee, FL (Alligator Alley) Open 2019 At Ochopee on Alligator Alley the only suitable location is the Miccosukee Service Plaza. 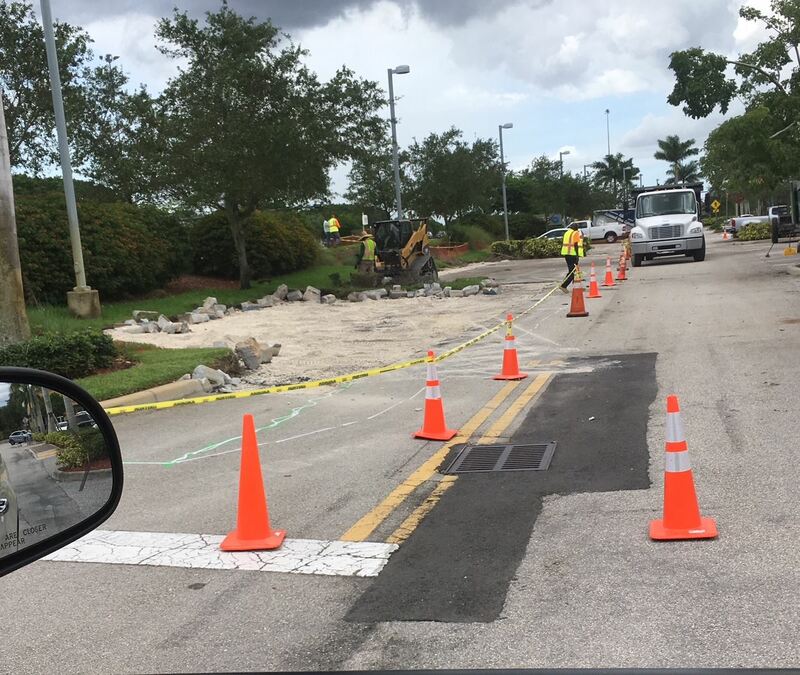 Saint Johns Open 2019 New Supercharger Station discovered under construction in Winn-Dixie parking lot in Saint Johns Commons [South Jacksonville] (Public) Currently this station is not on Tesla's Find Us map. On November 4, 2018, the Dellagio Town Center invited our club to display our Teslas to the public at an exclusive Tesla Car Show centered around their signature fountain inspired by the famous Place de la Concorde. The Dellagio Town Center is a hidden gem on Restaurant Row in Orlando featuring over 130,000 square feet of dining and entertainment in a European inspired development reminiscent of Italy. Although the weather didn't exactly cooperate on this Rain or Shine event, the glistening brick pavers provided a dramatic backdrop for the Teslas on display. Much thanks go to Angelia and David for serving as hosts of this event. Following the Car Show for dinner and libations our members gathered at Urbain 40, an American Brasserie and Lounge with an atmosphere reminiscent of the big band era. Yesterday, Tesla, GM, Nissan, and other EV stakeholders formed the EV Drive Coalition to reform the electric vehicle tax credit. The EV Drive Coalition brings together a diverse group of industry, consumer and environmental stakeholders with a single unifying mission: encourage passage of legislation reforming the federal electric vehicle tax credit to ensure that it works better for more consumers for a longer time frame and spurs increased growth of the U.S. EV market. Please visit their website at EV Drive Coalition for more details. Make sure to click on the GET INVOLVED link to voice your support of this initiative to your members of Congress. The Castillo de San Marcos is the oldest masonry fort in the continental United States. It is located on Matanzas Bay in the city of St. Augustine. Florida Tesla Enthusiasts enjoyed a relaxing weekend getaway in historic Saint Augustine from October 26 to November 3, 2018. This event was structured such that each family could spend one, two or three days (Friday through Sunday) to suit their schedule. We arranged for group hotel rates at the Holiday Inn St. Augustine-Hist. District and Best Western Historical Inn, St. Augustine. Both hotels had Tesla Destination Chargers and were conveniently located in the historic district of St. Augustine. On Friday, we had a casual reception at the bar at the Holiday Inn, followed by dinner at the nearby MOJO Old City BBQ. Great BBQ! On Saturday, morning we arranged to have Old Town Trolley Tours pick us up adjacent to the Holiday Inn for a private guided tour of portions of historic St. Augustine. Our group fee included unlimited self-guided, hop on/hop off the continuing trolley route for a total of 3 days. The trolley tour conveniently dropped us off at the St. Augustine Distillery where we had a fascinating tour followed by free tastings. After the distillery tour we had a delicious brunch/lunch at the Ice Plant Bar located in the same building as the distillery. The distillery and bar are located in the historic Florida Power & Light Ice Plant building. 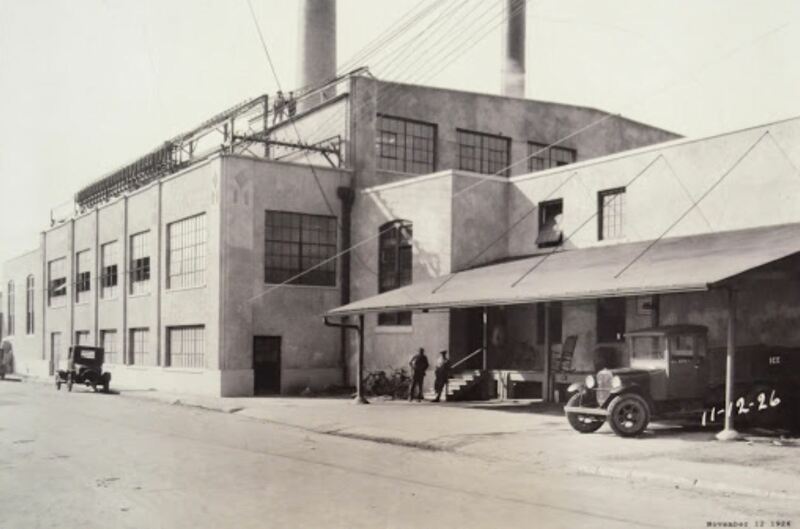 Built as part of St. Augustine’s ﬁrst power and ice complex in 1907, it was the ﬁrst of it’s kind to make commercial block ice in Florida over 100 years ago. The building was lovingly restored and brought back into service as a distillery and and restaurant/bar. It is on the National Register of Historic Places. After brunch/lunch members were free to jump on and off the trolley route at their own pace to continue to tour historic St. Augustine. Saturday evening we had a truly lovely private group dinning experience at the Raintree Restaurant. 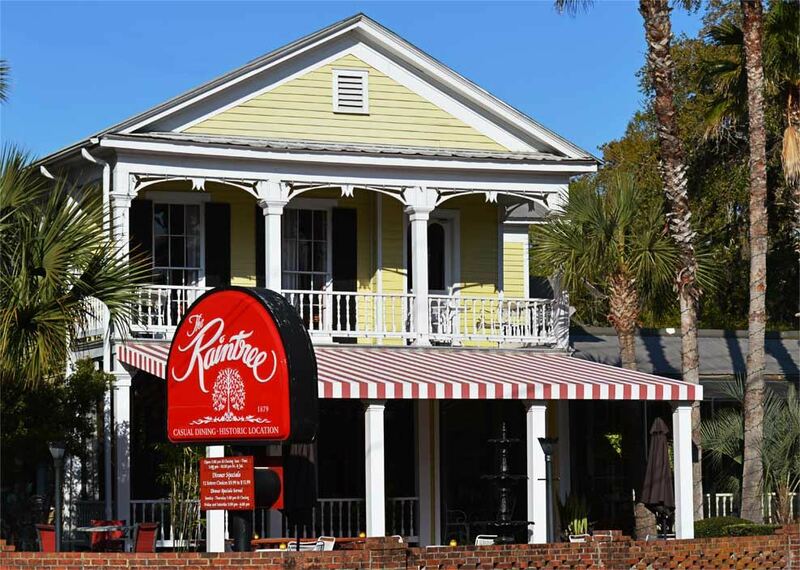 In addition to providing fine dining, the restaurant is located in a stately 129 year old Victorian house. It is one of the last survivors of a period of development that began in this part of St. Augustine after the end of the Civil War. Here's some photos of our members enjoying themselves. Tyna, the trolley lady (second from right) distributes tickets. Our merry group poses with our driver at the Distillery Tour stop. At the Ice Plant Bar. They had a delicious and distinctive menu. At the Raintree Restaurant. Causal, yet fine dining in a 129 year old Victorian home. If socializing with other Tesla enthusiasts across the state looks like fun, please click on the "Home" menu item above to learn more about our club. To join, please click on the "Join Us" menu item. On October 13, 2018, Florida Tesla Enthusiasts were treated to a tour of Babcock Ranch, the city of the future. The event was well-attended with over 40 members with their guests registering to attend. Following the tour we enjoyed a delicious lunch at Table & Tap, with farm-to-table dining. Babcock Ranch is a new master-planned community under development on the Lee and Charlotte County line in Southwest Florida, about 15 miles northeast of Fort Myers. With 18,000 acres of land, Babcock Ranch is an area larger than Manhattan that will accommodate 19,000 homes and 50,000 residents when completed. With more than 340,000 solar panels in place, Babcock Ranch aims to be the first town in the U.S. powered solely by solar energy. In partnership with Florida Power & Light Company (FPL), Babcock Ranch donated 440 acres of land for a 74.5 mw solar facility. FPL created the largest solar-plus-storage system operating in the U.S. today. Each of the ten battery storage units at the FPL Babcock Ranch Solar Energy Center can store 1 megawatt of power and discharge for 4 hours. The new battery storage system ensures a steady output of power even on partly cloudy days. Residents will live in energy-efficient homes and use self-driving electric shuttles to get around. Alternative internal transportation systems employ advanced and developing technologies to provide environmentally-friendly ways to get around town. In addition to electric-powered, self-driving shuttles running along set routes, Babcock Ranch is an early implementation site for on-demand self-driving cars that you can schedule with an app on your smart phone. Babcock Ranch provides EV destination charging. We head out to the Solar Array with almost a full bus. Florida Power & Light built this observation deck from which to view the extent of the huge solar array. Part of the huge solar array. On the left are the 10 battery storage units undergoing testing. What a greating looking group! My wife poses with Jason Caissie, the leader of the Southwest Florida EV Owners Club. Notice his electric scooter. Jason and his wife are waiting to move into his new home being built in Babcock Ranch. One of the autonomous shuttles drives a prescribed route. Dining at Table & Tap. Slater’s Goods & Provisions is a market and café at Babcock Ranch that offers a farm-fresh menu. Here's a collection of random photos of our happy members. Please scroll down to the bottom of this article for current status. 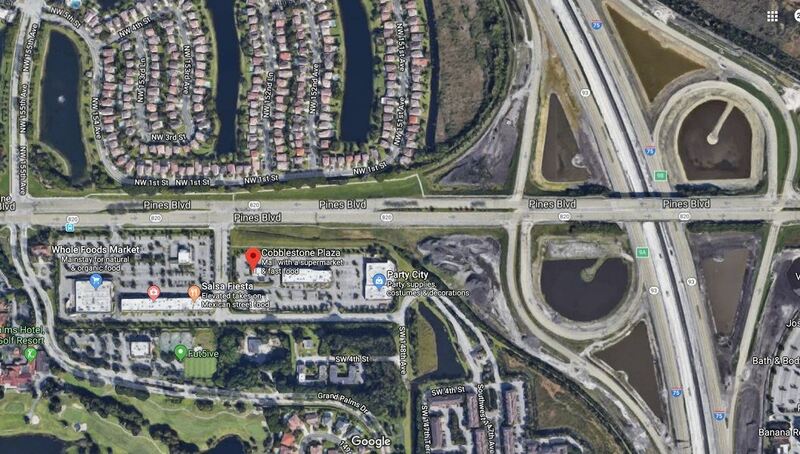 A member of the Tesla Motors Club forum recently discovered a permit for a "Tesla Charging Station" submitted on March 22, 2018 to the City of Pembroke Pines. The address of the location is 14916 Pines Blvd, Pembroke Pines which corresponds to a Chase Bank in the Cobblestone Plaza Shopping Mall. The Tesla website's Find Us map lists a Pembroke Pines "Coming Soon" Supercharger Station targeted for the end of this year. The vicinity map above of the Cobblestone Plaza shows that it is strategically located right off of I-75. Although the permit information doesn't explicitly use the words Supercharger Station, the language virtually confirms that this is a Supercharger Station with a mention of transformers, control panels, multiple charging stations, fault current, service equipment and control cabinets. It also mentions 16 "charging posts". As a result we are very confident that this is the "Coming Soon" Supercharger Station. Apparently the permitting folks need more information from Tesla's Electrical Contractor and have denied the electrical application until it is forthcoming. Update as of May 31, 2018. Tesla's civil engineering plans were approved on May 31, 2018. Update as of June 29, 2018. It looks like the building permits were approved and initial work started in the parking lot. The photo below was provided by a member of the Tesla Motors Club forum. 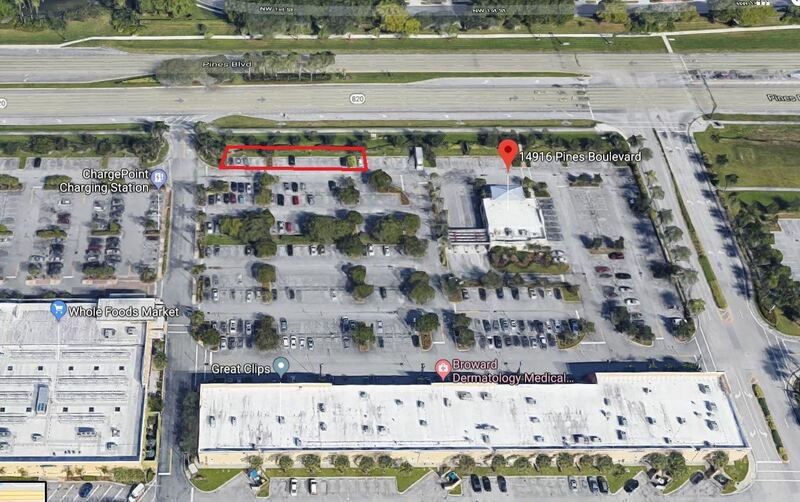 It appears the Superchargers will be located along the North edge of the parking lot parallel to Pines Blvd between Chase Bank and Whole Foods. The rectangle in the Google Street View below shows the location of the construction area for the Superchargers. Update as of October 11, 2018. The Pembroke Pines Supercharger Station is now operational with 16 - 120 kW charging terminals.